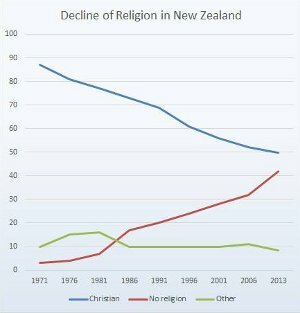 Statistics New Zealand recently released the first summary figures around religious belief. The decline of religion was even more marked than that projected. John Murphy, President of the NZARH, was quoted in the New Zealand Herald talking about the census results and what it will mean in terms of the point of view of the non religious being accounted for in policy and legislation. Peter Harrison talked on Radio New Zealand about how a influx of immigrants have changed the landscape of religion, and that Christians are now not in the majority. The official results; 1,635,348 people said they had no religion, 1,879,671 people said they were Christian of various denominations. while a total of 3,901,164 people responded to the question on religion. The outcome: Christians are now just over 48% of the population. The information released to date is only summary. It does not break down the data by region. The detailed information will be released next year. The NZARH conducted a nation wide radio campaign earlier this year when the census was in progress. The message was to those who had no faith but identified with a religion for social reasons. The campaign asked them to truthfully tick the ‘no religion’ box.